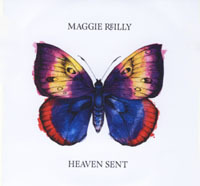 Share the post "Album review: MAGGIE REILLY – Heaven Sent"
Maggie Reilly frequently features in our singer-songwriter sequence on Get Ready to ROCK! Radio and , since 2009 when we interviewed her, she has become a firm favourite. Her solo albums are always worth investigating, but with ‘Heaven Sent’ she has seemingly drawn on all the high points of those works to fashion perhaps her first really cohesive album. Those of a certain age will remember her first major band success with Cado Belle in 1974, ten years or so later she was to achieve wider success in Mike Oldfield’s band and as a co-writer of ‘Moonlight Shadow’ and ‘Foreign Affair’. If you think she’s not cool, Leaves Eyes covered ‘To France’ (on Oldfield’s album ‘Discovery’) on their album ‘Meredead’. She sometimes gets confused with that other Scot, Maggie Bell. And she maintains great popularity in Scandinavia and Germany. If you like Celtic-crossover artists like Clannad you will pick up similarities here, from the overt (‘Stars At Night’, ‘One Autumn Day’) to the more subtle (‘Leanan Sidhe’, ‘Fare Thee Well’) . But the Celtic influence is not too intrusive – it almost forms a gentle undertow to some of the pieces. More recently Maggie has produced ‘Rowan’ (2006) which mixed English and Scottish folk songs so this should come as no surprise. The album features some standout pop-rock (‘Juliette’, ‘Judas Kiss’ for example) but also some more adventurous pieces that show Maggie’s versatility and a willingness to experiment with interesting instrumentation. Of course, she is no stranger to stretching her musical comfort zone and spent some time post-Oldfield making dance tracks for a German producer. On ‘Heaven Sent’ this bravery even extends to use of the dreaded auto-tune on ‘Break of Day’ which is almost prog in its execution punctuated by urgent guitaring from her faithful stalwarts Hugh Burns and Davie Dunsmuir. ‘Cold The Snow Clad Mountain’ has an irresistible chorus and the lyrics came to Maggie after she experienced writer’s block towards the end of the album sessions. ‘If’ is a lovely ballad punctuated by a mournful fiddle (Duncan Chisholm) and with ever-faithful collaborator Stuart MacKillop on piano. Although singles are less significant these days, it still must have been difficult to select the first (‘Juliette’) because the opener ‘Stars At Night’ is a close contender. The title track is possibly the weakest on the album in the sense that it is a little clichéd and has the all too familiar flush of a seventies soul ballad. We hope this new release will have the effect that folks go and search out her earlier albums. They won’t be disappointed and should have a look at our archive review for more information (see link below). (1996′s ‘Elena’ is a very good starting point). This entry was posted in ALBUM REVIEWS, ALBUM REVIEWS (Mobile), All Posts and tagged album, Cado Belle, Celtic, Heaven Sent, Maggie Bell, Mike Oldfield, pop, review, singer, songwriter. Bookmark the permalink.